MONTREAL, Oct. 04, 2018 (GLOBE NEWSWIRE) -- PyroGenesis Canada Inc. (http://pyrogenesis.com) (TSX-V: PYR), a TSX Venture 50® high-tech company, (the "Company", the “Corporation” or "PyroGenesis") a Company that designs, develops and manufactures plasma waste-to-energy systems and plasma torch systems, is pleased to announce today that, further to the press release of September 18, 2018, it has received a down payment of US$699,985 (approx. Can$897,919) towards the previously announced order for two (2) DROSRITE™ furnace systems (the “Systems”) from an Asian client (the “Client”); the name, and value of the contract, remain confidential for competitive reasons. 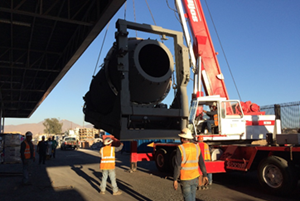 The order was for two (2) DROSRITE™ Furnace Systems, each with a capacity of 5,000 tons/yr. The Systems are the third and fourth commercial systems sold to date, and the first order from this Client. Delivery of the Systems is expected to be in Q2 2019. The procurement process has already begun. Separately, further to its Press Release issued July 26, 2018, the Company confirms that the second DROSRITE™ furnace system has been delivered to its client’s facility in North America, and is now complete.